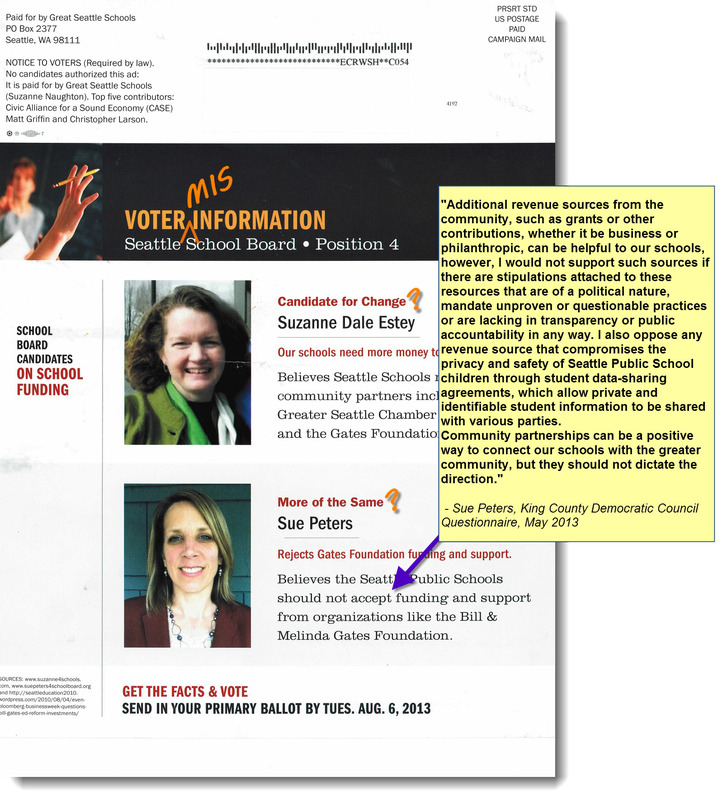 Last week, a mailer was sent out to thousands of voters in Seattle School District 4 by a small group of supporters of Suzanne Dale Estey: Suzanne Naughton of the Great Seattle Schools, the Civic Alliance for a Sound Economy (CASE, the political action committee of the Chamber of Commerce), local businessmen Matt Griffin and Christopher Larson. It contains false and incomplete information about my campaign. My views, qualifications and endorsements are misrepresented or omitted altogether. Though there are three candidates in the race, I am the only one singled out for this treatment. Like many others, I was disturbed to see supporters of my opponent resort to such dishonest tactics on her behalf, and so early in the race. Yet, it is also an indication of the strength and appeal of my candidacy. I am proud of our authentic and smart grassroots campaign, which has focused on ideas and solutions to serious school district issues. Already we have been able to achieve a great deal, powered by dedicated volunteers, and connecting with supporters throughout the city. Our campaign has managed to win significant and sole endorsements, including that of The Stranger, the M.L. King County Labor Council, and various Democratic organizations, and has earned the highest marks in the race from the Seattle Metropolitan Elections Committee. I was gratified to hear from many voters that the mailer had the reverse effect of what was intended. It made them more inclined to support me, and disgusted with the negative tactic. It even resulted in a surge in our campaign contributions that week. Though her own campaign did not generate the ad, my opponent, disappointingly, has not denounced it. Meanwhile, I remain focused on issues that are important to the public who value my nearly 10 years of experience and deep knowledge of the Seattle Public School District, my local and national advocacy and service for public education as a Stanford-trained journalist, and my commitment to representing all the people of the Seattle Public School District. In the interest of truth and accuracy, here are some corrections, for the record. 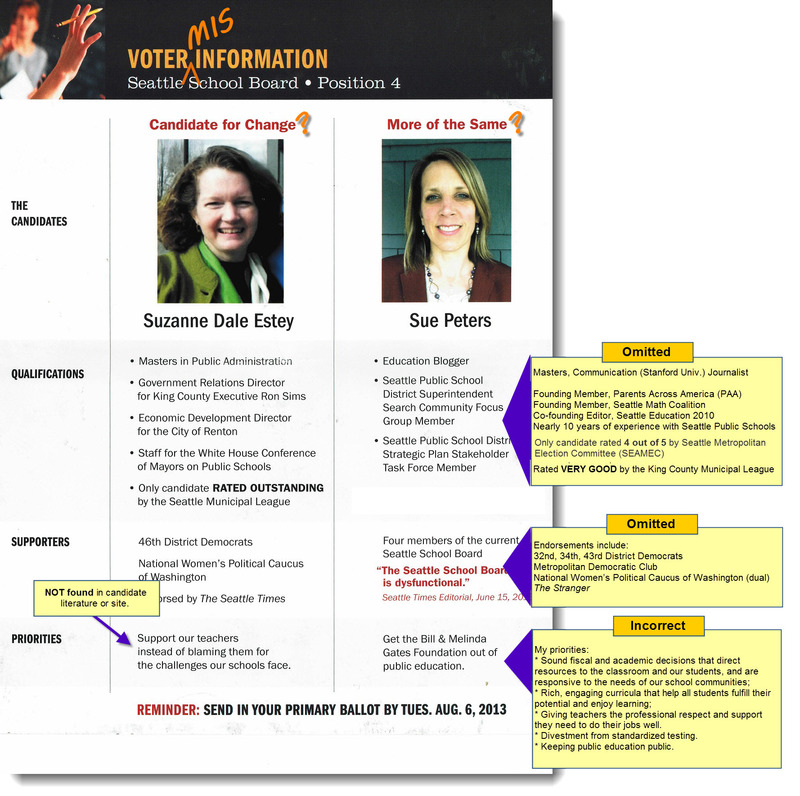 August 2, just a few days before the primary election, the same group of individuals who launched a smear campaign against my candidacy the previous week sent a second, similar 4-color, two-sided mailer to thousands of voters in Seattle’s District 4. Once again, real estate developer Matt Griffin, former Microsoft executive Christopher Larson, the Civic Alliance for a Sound Economy (CASE) the PAC of the Chamber of Commerce, and “Great Seattle Schools,” a new PAC created to support the school board candidacies of Suzanne Dale Estey and Stephan Blanford, has issued another negative mailer targeting me. This is a clear attempt to influence the election using unlimited independent expenditures and illustrates the negative influence of unchecked funding in politics. It’s ironic that this group, which is criticizing me for being concerned about the unaccountable, unelected influence of private money on public education, would illustrate my very point with their attempt to influence this election with their private money. This unprecedented leap into negativity in a school board primary has caught the attention of the local media, Publicola (Independent Expenditure in the … School Board Race), even the Seattle Times (Independent group enters school board campaign with negative ad), and has now made national news with my new endorsement from the Network for Public Education, Dr. Diane Ravitch’s new advocacy organization. Meanwhile, my opponent, Suzanne Dale Estey, has told the Seattle Times that she agrees with the dishonest message her supporters are spreading. Send a positive message. Help support our community-based, grassroots campaign. Sue, Excellent responses to the Estey/Chamber Hit Piece. Glad to see you got back to them ASAP on this with very good answers.